Monday, 21 June, 2004, 6:56 pm, YHA, Earl’s Court, London. So what happened to me today? After getting on the plane, finally realizing what I was doing, and popping one of Ron and Linda’s presents — Gravol — I tried and failed to sleep. Shortly before we landed I started talking to a just-married couple who’d been to Heathrow before, but never Gatwick. I stuck to them. At immigration, the fellow looked at my Ancestry visa and asked me which grandparent was born in the UK. That’s all. We found our bags (mislabelled as being from Calgary?!) then our way out — and there was Jenn. She helped Allison, Dennis, and I find our way onto the train into the city — and the man who sold me my ticket was the 1st of several people today to call me “luv”. We were also offered a beverage — including alcohol — at 11 am, before getting out at Victoria Station. We were totally lost when a lady offered directions — how nice! Found the hostel, found my room in the labyrinthine hostel, dumped off my stuff, then Jenn took me grocery shopping. I confess, I got a bit annoyed — all her advice was great but…I want to find out the culinary culture shock for myself — that’s part of the point. Example: Lightly Pressed Cloudy Apple Juice. Never, NEVER in North America would you find a more honest food label. I was a bit weirded out that this literally cloudy stuff was the only kind of apple juice in the entire shop, then looked at the ingredients. Apples. ONLY. Oh…this is what the JUICE of APPLE should look like. Bought food, dropped if off, back on the Tube to go to Canada House. (They actually do say, over the loudspeakers, MIND THE GAP, btw.) Jenn and I get out at Leicester Square — where the tkts booth is!! — grabbed an excellent mozzarella & veggie sandwich from a shop on a side street, then went to Trafalgar Square. National Gallery, Canada House, and Nelson’s Monument. It was — literally — too big to absorb. After being rained on intermittently, we went into Canada House so I could send an e-mail confirming my arrival, and there we saw Dennis & Allison again! They asked me to come by their hotel Wed. evening — 2112 — to perhaps do something. I was starting to feel run-down — Jenn insisted I MUST stay awake until my regular bedtime hour here, to reset my clock. So I asked if we could walk down to the river — the Thames. On the way we passed the gate to Buckingham’s gardens, the Horse Guards’ stables — two were at attention, on horseback. I stroked the nose of one horse — I think that’s what convinced me I am actually here. We continued on past Whitehall, then came to a street closed off by what looked like bike racks, and surrounded by bobbies. I said to Jenn “Is that Downing Street?” She said yes, and asked “Is it always like that?” She observed that Tony Blair wasn’t the most popular guy in Britain right now. She then elaborated on what wouldn’t happen if England won the quarter-final in Euro 2004 tonight — and what would happen if they did. 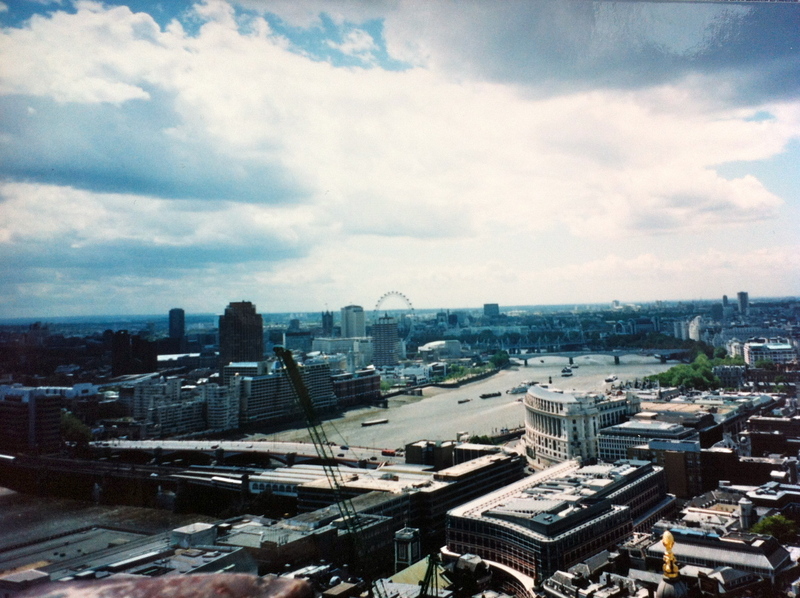 London, from the cupola of St Paul’s Cathedral. I was speechless, because by this time we’d reached the riverbank and I had the London Eye, Parliament and Westminster Abbey in front of me. Jenn had to get to Liverpool Station to get back to Glasgow. I figured she was right — I should buy my train ticket to Edinburgh sooner rather than later — I looked at my hostel booking from March, and now realized it was for the week of July 27, not June! Before that could sink in, the Tube announcer said the line would be disrupted because of a person under the train at a station ahead. I quietly said to Jenn “How often does that happen?” We reached Liverpool Station eventually, and were accosted by a guy dressed as lemon-yellow terrycloth dog, also carrying a bucket saying “Help the Aged”. Jenn gave him 50p. I was — I kid you not — a little scared. Two in one day?? Then I remembered: I’m in London. Jenn left me to get on her train, and I almost got back to Earl’s Court on my own — then got off one stop too early, got hopelessly lost trying to find my way back to the hostel, then a very nice elderly gentleman took pity on me, looking helplessly at my Let’s Go and (useless!) London A to Z books, before telling me I was only a block away from Bolton Garden. He didn’t tell me it bends. But I did get back here, ate my microwavable salmon, and am now trying to decide if I should go have a pint somewhere and watch the football match. 6 pages for Day 1. I am actually HERE. This entry was posted in musing, photo, travel, writing and tagged ancestry visa, buckingham, canada house, cloudy apple juice, culinary culture, culture shock, earl's court, england, euro 2004, gatwick, heathrow, horse guards, hostel, liverpool, london, London eye, luv, national gallery, nelson's monument, parliament, plane, train, tube, uk, victoria station, westminster abbey by theatrejunkiehm2012. Bookmark the permalink.